My husband and I went to a moving sale a month ago, and this rustic saw horse was marked free. Although my husband did not see the need to bring it home with it's rotten spots and all, I thought it would be a fun junk garden piece. Or maybe even a fun Rustic Christmas display piece. 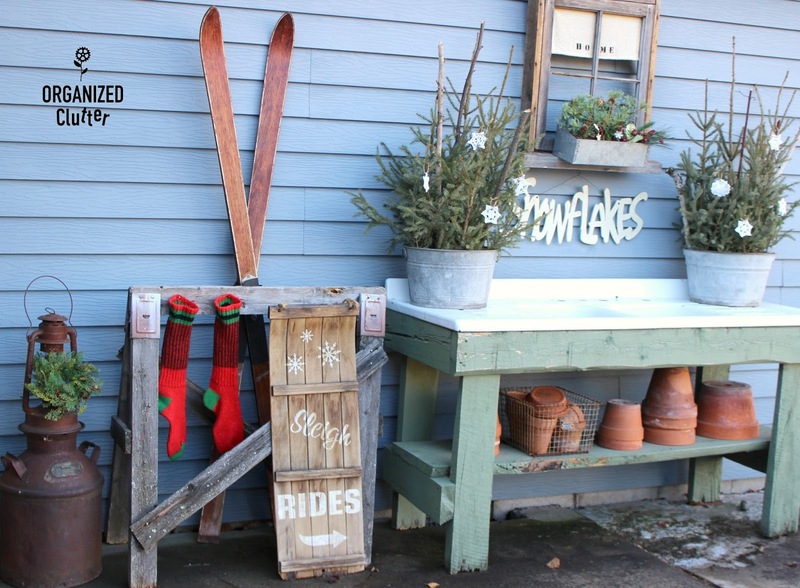 A foot of snow may be on the way this weekend so I am finishing up some outdoor vignettes. 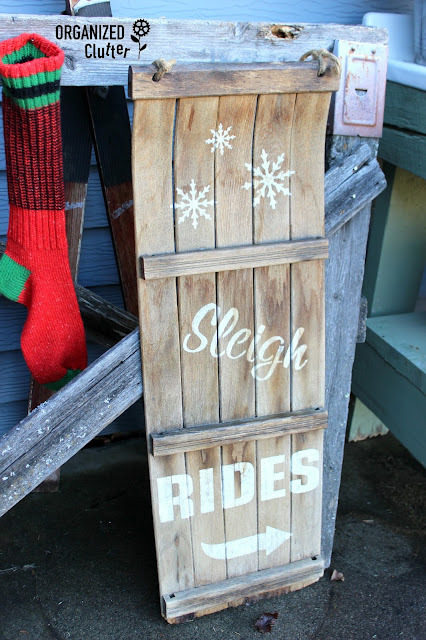 I just finished up stenciling this old toboggan with Funky Junk Interiors' Old Sign Stencils *Sleigh Rides and Winter Graphics. I used white craft paint for the lettering and sealed the toboggan with water based polyurethane. Here are old wool stockings hanging by nails on my saw horse. 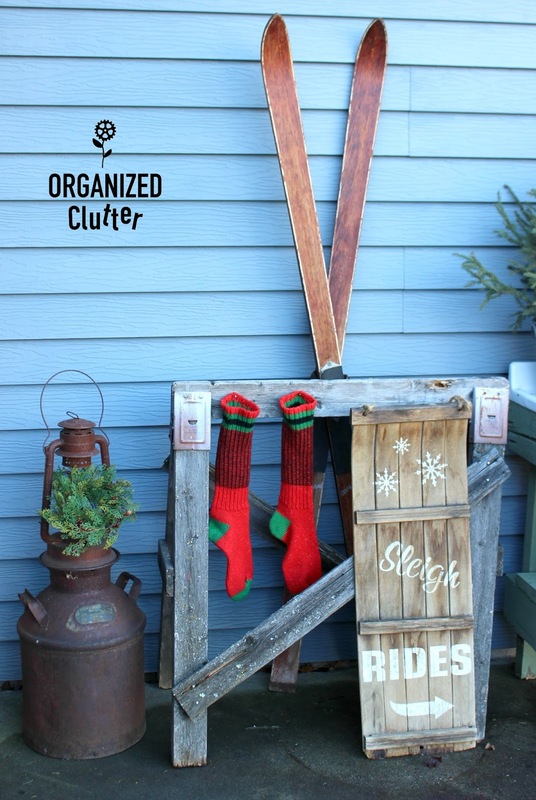 Skis, a rusty milk can and lantern complete this vignette. I tied the skis to the saw horse with jute just in case the wind tried to blow them over. My potting bench has more Rustic Greenery Spruce Tip Buckets on each side of my Window Frame Flower Box has faux winter greenery tucked in the summer garden box soil. 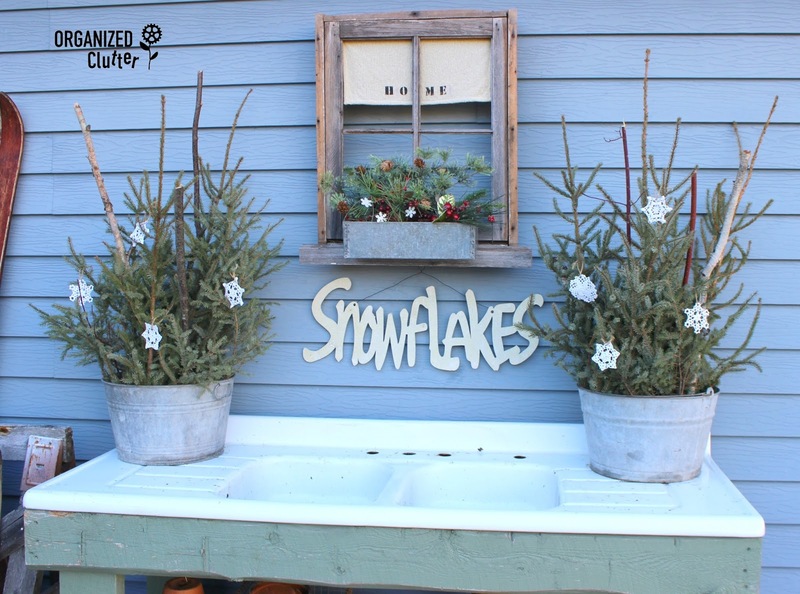 Crocheted starched snowflakes hanging from jute, add interest to the buckets of winter greens. 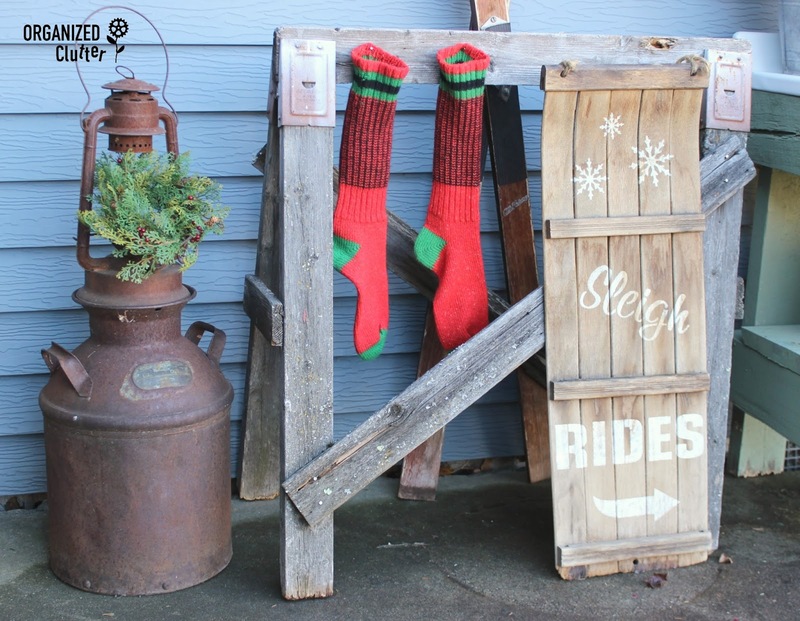 Getting ready for Christmas with rustic outdoor junk displays! Love how you used the saw horse. Looks great!! I love this, Carlene! You have the best imagination! It's a perfect place to display your fun outdoor Christmas decorations, Carlene! Looks wonderful! I love your outdoor displays. You are so creative! I love your junk displays! Just my kind of decoration...now that sawhorse...I probably wouldn't have given it a second glance, but look what you did with it! We are kindred spirits! I have "ADD" - "Addictive Decorator's Disease". Love your ideas and creativity. The sawhorse is a super fun piece Carlene. Love what you came up with!